One summer evening, years ago, my friend, Gretchen and I were taking an after dinner stroll. It was a nice evening and, as we came upon the cross street, we saw a convertible approach the traffic light. It was perfect convertible-weather. We were admiring their ride from afar, and noticed that both of the passengers were eating some yummy chocolate-colored confections on a stick. About that time, the light changed to green and off they went. Gretchen and I put on our thinking caps, determined to find ourselves some of those treats! (This is fitting since she is an investigator and I love to problem solve- Dave lovingly calls me “Encyclopedia Jules”and we both love dessert!) We began to think about proximity. They had to have been purchased nearby, as it looked like a frozen treat they were eating. Since there were no ice cream or popsicle shops nearby, we decided to stop into the cute neighborhood market that was across the street. We walked around the store, searching for what they had. We found the frozen case, saw ice creams of various flavors and then we saw it! Diana’s Bananas. 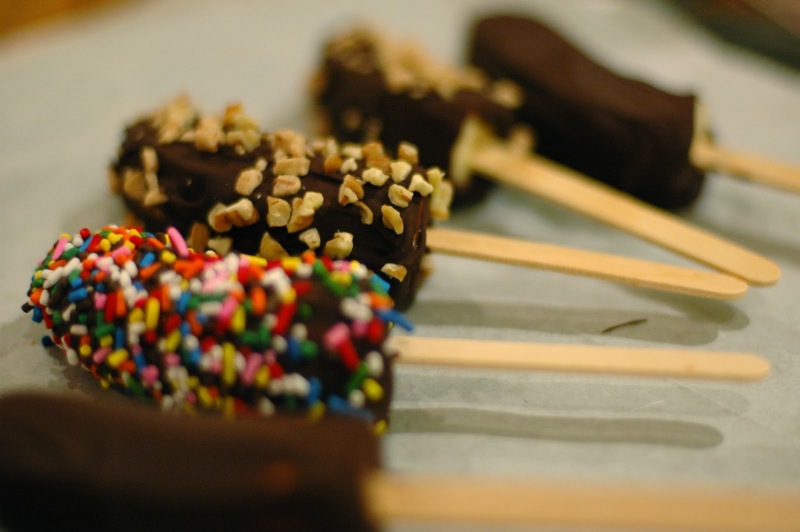 A chocolate covered frozen banana on a stick. YES! This must be it! And they came in several varieties. We were then faced with the challenge of deciding if we should get banana babies or the full size; milk or dark chocolate; with chopped peanuts covering the outside or plain! It’s fuzzy in my mind which we chose that night, since it was long ago, but I think we went for the dark babies and the peanut covered ones too. I think we knew we would be coming back for more to give equal opportunity to them all! As we were enjoying the treats, we quickly determined that these would be very easy to make, at much less cost, and could customize them. So, we did, and I have been making them ever since. The frozen banana has the texture of ice cream, but is far healthier. I haven’t seen the Diana Bananas in stores in years, but I found them online and they seem to be alive and kicking! Peel and cut bananas in 1/2. 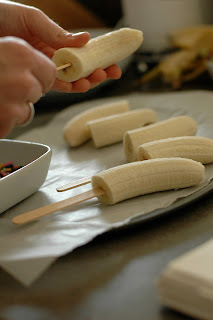 Gently insert popsicle sticks into the flat side. Place on a parchment lined baking sheet and place in freezer for 15 minutes or so. Meanwhile, melt 1 cup chocolate chips and 1 Tbsp butter or canola oil in a microwave oven by 30 second increments stirring in between until melted and smooth. Prepare dishes with toppings (if so desired) Remove bananas from the freezer and gently smooth chocolate over each banana, one at a time, covering completely. While the chocolate is still wet, roll in topping to coat evenly. Place back on the parchment lined pan and return to the freezer for several hours until bananas are frozen solid. After frozen, you may place them in a sealed container to keep in the freezer for serving at a later day. Or you can gobble them up immediately! They are a hit with kids and adults alike. If you find that you have extra chocolate, I believe you have two options: lick the bowl with a really good rubber spatula or throw something in that bowl to dip and coat…like these pretzels. Yum! I had no idea you had this one up your sleeve!! Can't wait to try them! Thanks for the fun idea! DIdn't mean to keep it a secret :)! If you feel courageous, you can even have the kids help with this project. I don't know how I am just now finding your blog, but one word… LOVE. Thank you for the encouragement! It keeps me going to know it's connecting with people! !